I haven’t ridden all the climbs in the UK, but it will be hard to beat Hardnott Pass for difficulty, drama and the beauty of the surroundings. I always think of Hardknott and Wrynose pass as the King and Queen hill climbs of England. In terms of overall length and height gain, it is not particularly spectacular. 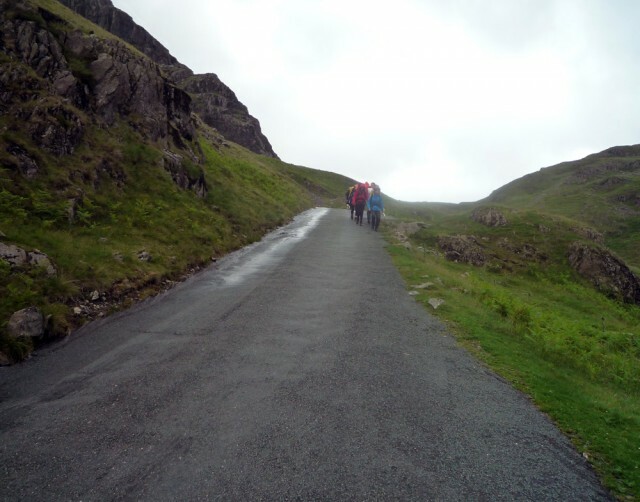 But, the great attraction (or should I say feature) of Hardknott is its unrelenting steepness. Sometimes 1/3 signs overrate the gradient of the actual climb. But, with Hardknott pass, the 1/3 is really merited. No matter which line you take, you can’t avoid considerable sections of 30%. This is really steep; it’s so steep you can have a strange feeling that you might fall over backwards when climbing. 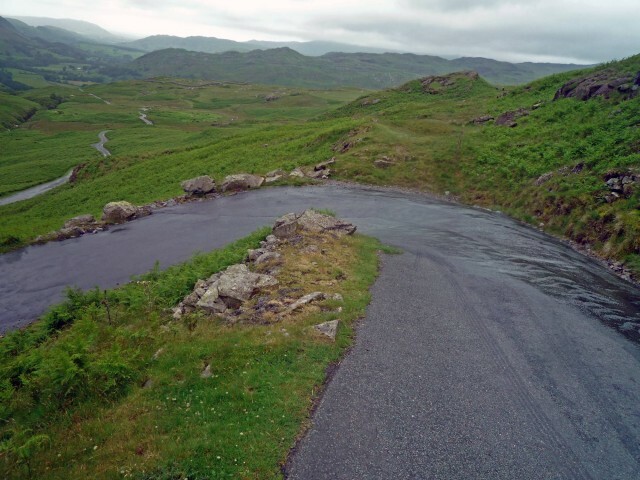 No matter how fit or not you are, getting up Hardknott pass gives a sense of achievement, which is hard to replicate on longer, but shallower climbs. Hardknott pass is not particularly accessible, hidden away in the Esk valley in the West of the Lake District, but it is definitely worth a visit and climbing both sides. 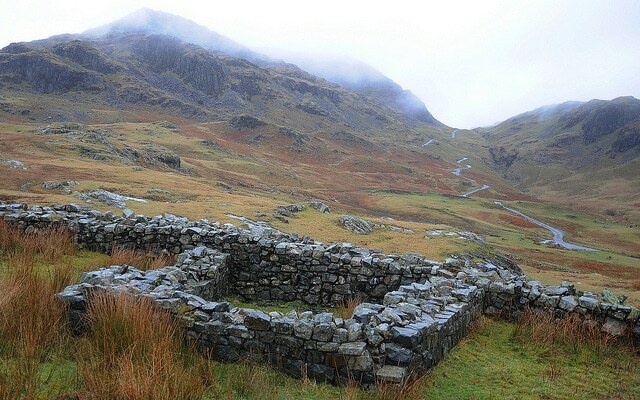 Originally Hardknott was a Roman fort used to keep the pesky locals at bay. The descents are pretty tricky too – check your brake blocks before riding. Unfortunately, the road surface was pretty shocking on the East face, when I went in 2013. Also, it is so steep, cars and larger vehicles can really struggle (you wouldn’t believe the inappropriate vehicles people try to drive up the 30% hairpins.) Before climbing, it is worth looking around to see if there is traffic jam in front or behind you. It is best if you can climb unimpeded by traffic. looking down hardknott towards Eskdale. The hairpins were slippy. Wheelspin can be a real problem. As you leave the River Esk, there is a gentle ascent before you hit the first 20% slopes. This is just a foretaste of what is to come, but it is really hard for about 500m, before the 20% gradient eases off, giving you some time for recovery as it averages a mere 8% for a km. But, you willwant to keep your bike in a low gear as you prepare for the final section. After this relative respite, you will need to get ready for the final section of twisting 30% hairpins. It’s unbelievably tough to pull yourself around these corners. If you don’t have the right gears, you will be getting off and walking. You can help yourself a little by going wide on the corners, this slightly lowers the gradient – but not much. You will need to do a lot of pulling on your arms. It’s not just your legs that will be burning. Hopefully, you won’t get stuck behind a tractor. Cars and large vehicles can also struggle and come to an almost complete stop. You will be climbing to the smell of burning clutch. As the top approaches, the gradient mercifully eases off slightly. When you feel the gradient reducing, you know you’re going to make it – there is a great sense of relief! Hardknott. Photo S Fleming from Fred Whitton 2009. At the top, it’s worth stopping to have a look behind you – it’s hard to believe what you have just climbed. The descent is pretty tricky – 30% hairpins. Cars really struggle on the descent too, so be careful. Check your brake blocks before visiting! Just to make it harder the Fred Whitton Challenge means you will come to Hardknott Pass with 100 miles in your legs, and major Lake District climbs already done. No wonder this is a sportive with one of the greatest reputations in UK. Hardknott pass East to west. This is not particularly long, but it is really steep. There is an amazing straight section of 30% towards the start of the climb. There is no option but to go straight up – you have to commit or fall off trying. You can’t afford to hesitate. It is quite an experience climbing this section. I often get a strange sensation climbing this part – it’s like you could fall over backwards – it’s that steep. After that there are several hairpins. You can reduce the gradient by going wide, it gives a chance to recover at least before the next surge upwards. 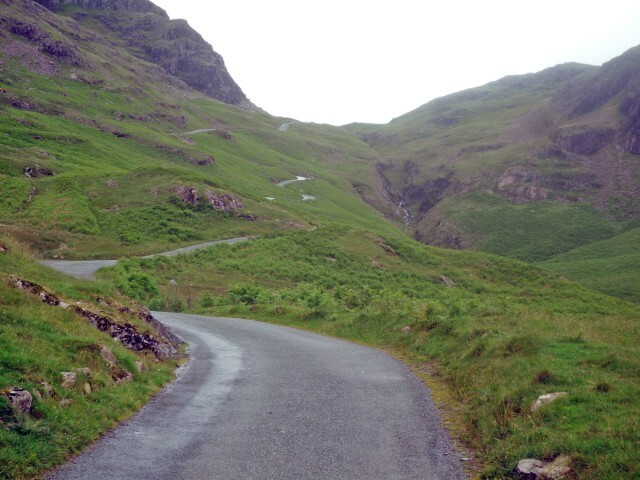 This is a fantastic climb, going up the hairpins of Hardknott is an experience you won’t forget in a hurry. Most people will climb Hardknott East to west after already climbing the very difficult Wrynose pass. After a partial descent into Cockley Beck, the road forks. Left takes you down to Duddon Bridge, straight on takes you up Hardknott pass. If you thought Wrynose was tough, Hardknott is much steeper. You can always turn left towards Duddon Bridge, there is a long way around to Eskdale. Car’s themselves had difficulties on these climbs. On Wrynose, a car went past me at about 5mph and nearly stalled. But, overall motorists were quite kind. I think they showed a rare degree of respect for a cyclist going up those hills. It is seriously steep, with wicked hairpins.. You really have to be very careful to avoid getting up any speed, because once you have momentum it’s hard to bring it back. My arms were aching by the end of the descent. 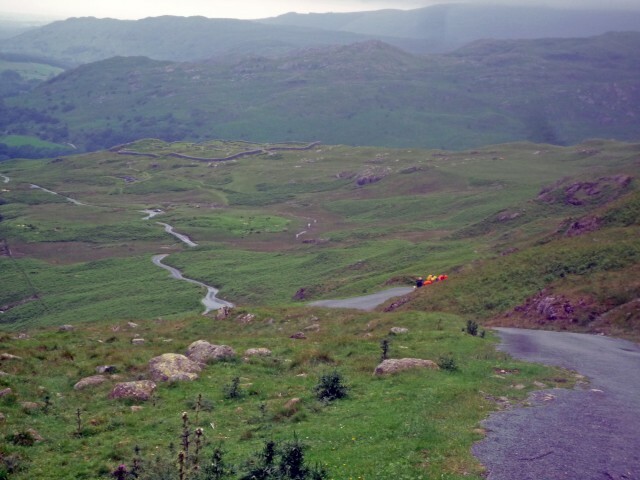 Hardknott Pass definitely deserves its 10/10 rating in 100 climbs. It’s definitely a must do climb. But, be warned, you might need a triple chainset or even compact. I now always make sure I have a 28 for my 39 chainring. I once climbed Wrynose pass on a 39*25, but I couldn’t face Hardknott with that gearing so had to come back another time. I’m very happy to say I climbed both these hills both ways on a 39\25 with 75 miles in the legs plus another 110 from the day before when I climbed Great Dun Fell. Hardknott is the only hill that terrifies me as a result! My whole body was shaking when I climbed it the second time from Eskell. Relief is the only emotion I can attest to. Brilliant riding in that part of the world. Thanks for comment! I think relief is something anyone will feel at the top. 39*25 is no joke for Hardnott. Thanks for the blog, I’m currently training for my first ‘Fred’ next month.. Been hitting Whiteleaf & Wardrobes every weekend, the only climb that I can find that comes anywhere near is the climb that goes past the Chiltern Brewery (sorry not sure what it’s called (25% in places). Is there anything close to the gradients of Hardknott in the Chilterns? (I’m based in Chinnor). I am doing the C2C on the 21st June with my son and his mate…I am 62 years of age but fit for my age….150 miles doesn’t bother me……I know it will be a big challenge but do you think it is doable (with a bit of walking up hard knott?? Hi Brian. It is definitely doable. Though the more training you can do, the better. Hi Brian. There are 6 of us doing C2C on the same day. We’re leaving St Bees at 5am so might see you along the way! I was thinking of you as I slogged up Hardknott last Saturday, half expecting you to fly past with a few gears to spare! You’re right this is an incredible hill climb and for me this was early on in the Coast to Coast (though I think this might be a different event to some of the others are referring to above?). 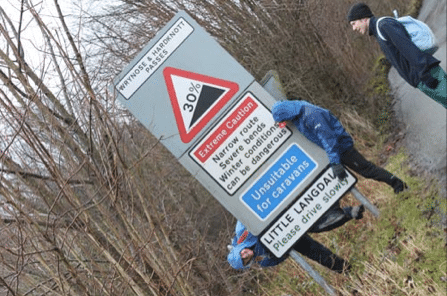 Great article – just completed the East to West ascent – without wanting to get too graphic almost experienced a spontaneous bowel movement such was the effort required! I tried scaling Wrynose from the East in 1996 with a 42×21… epic fail! Such lowest gear combinations weren’t considered so silly for amateurs back then. I went back last year with the middle and outer rings of a MTB chainset, so 32×26. Tough but OK.